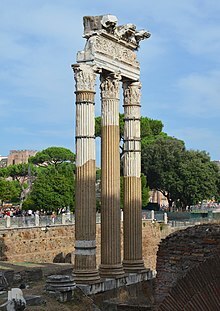 Festivals in ancient Rome were an important part of Roman religious life during both the Republican and Imperial eras, and one of the primary features of the Roman calendar. 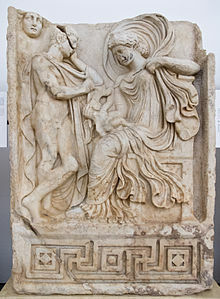 Feriae were either public or private, state holidays were celebrated by the Roman people and received public funding. 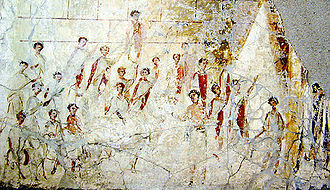 Games, such as the Ludi Apollinares, were not technically feriae, although feriae were paid for by the state, ludi were often funded by wealthy individuals. Feriae privatae were holidays celebrated in honor of individuals or by families. 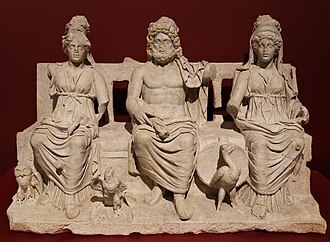 Conceptivae were annual holidays that were moveable feasts, the date was announced by the magistrates or priests who were responsible for them, imperativae were holidays held on demand when special celebrations or expiations were called for. One of the most important sources for Roman holidays is Ovids Fasti, varro defined feriae as days instituted for the sake of the gods. Religious rites were performed on the feriae, and public business was suspended, even slaves were supposed to be given some form of rest. Cicero says specifically that people who were free should not engage in lawsuits and quarrels, agricultural writers recognized that some jobs on a farm might still need to be performed, and specified what these were. 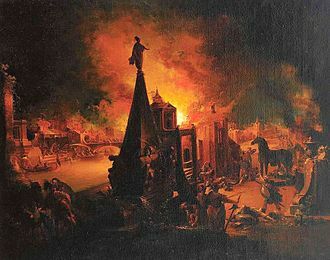 Some agricultural tasks not otherwise permitted could be carried out if an expiation were made in advance, within the city of Rome, the flamens and the priest known as the Rex sacrorum were not allowed even to see work done. 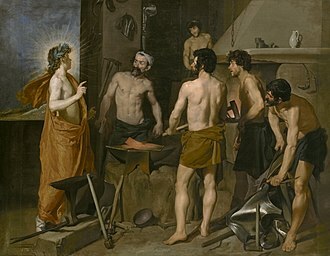 On a practical level, those who inadvertently worked could pay a fine or offer up a piaculum, work considered vital either to the gods or preserving human life was excusable, according to some experts on religious law. 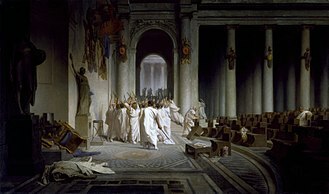 Although Romans were required not to work, they were not required to take any action unless they were priests or had family rites to maintain. Following is a month-by-month list of Roman festivals and games that had a place on the calendar. For some, the date on which they were first established is recorded, a deitys festival often marked the anniversary of the founding of a temple, or a rededication after a major renovation. 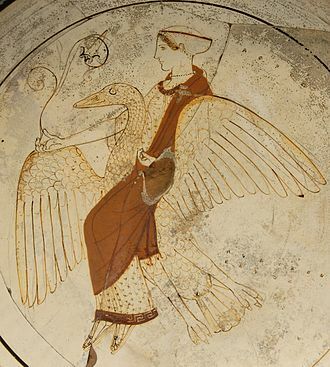 Hellenistic polytheistic traditions survived in pockets of Greece throughout Late Antiquity. 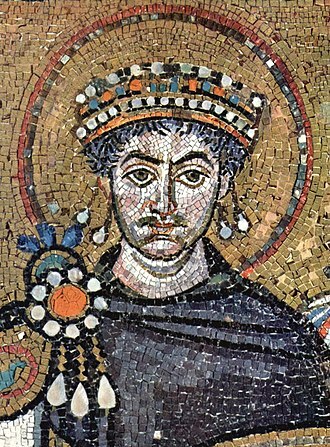 The Neoplatonic Academy was shut down by Justinian I in 529, under Roman authority, the various national myths most similar to Rome were adopted by analogue into the overall Roman mythos, further cementing Imperial control. 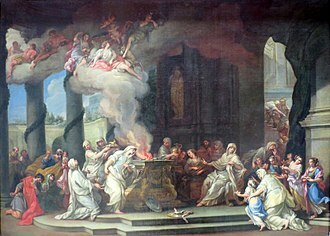 Consequently, the Romans were generally tolerant and accommodating towards new deities, the more philosophical outlook of the Hellenic parts of the Roman empire led to a renaissance of intellectual religious thought around the start of the 2nd century. A more organised form of alatrist henotheistic panentheism emerged in parallel to Hermetism, at least one major meeting place for followers of this neopythagoreanism was built in Rome itself, near Porta Maggiore, to a design similar to Christian churches, though subterranean. 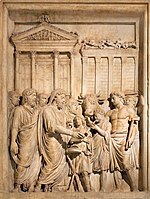 Neoplatonism began to be adopted by prominent scholars such as the Christian theologian Origen, during the rule of Gallienus, the imperial family themselves gave patronage to Plotinus, and encouraged his philosophical activities. Neoplatonism was further developed by Iamblichus, who believed that physical invocations would be able to produce soteriological results, Mithraism wasnt exclusive - it was possible and common to follow Mithraism and other cults simultaneously. 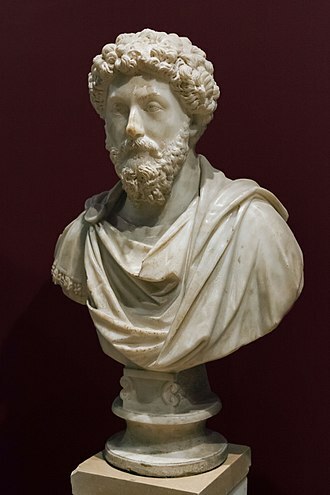 From the reign of Septimius Severus, less gender-specific and he rode roughshod over other elements of traditional religion, marrying a Vestal Virgin, and moved the most sacred relics of Roman religion to a new temple dedicated exclusively to El-Gabal. 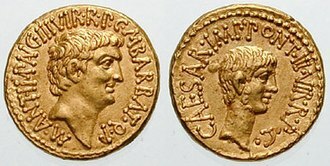 Nearly half a century after Elagabalus, Aurelian came to power and he was a reformer, strengthening the position of the sun-god as the main divinity of the Roman pantheon, he even built a brand new temple, in Rome, dedicated to the deity. Lactantius argued that Aurelian would have outlawed all the gods if he had had enough time. Imperial tolerance only extended to religions that did not resist Roman authority, religions that were hostile to the state or any that claimed exclusive rights to religious beliefs and practice were not included and some exclusive Eastern cults were persecuted. Jews were given special privileges owing to their dominance in economy and dispersal, tolerance of Judaism turned to persecution when collaboration was perceived as ending, see Anti-Judaism in the pre-Christian Roman Empire. The results included massacres of Christian communities and Jewish nationalist groups, the early Christian community was perceived at times to be an intrinsically destabilising influence and threat to the peace of Rome, a religio illicita. The same gods whom the Romans believed had protected and blessed their city, after the initial conflicts between the state and the new emerging religion, Gallienus was the first emperor to issue an edict of toleration for all religious creeds including Christianity. According to Christian polemicists writing after his death, Constantine I was baptized on his deathbed, eusebius, a contemporary Christian historian, praises him for having some pagan temples torn down. Actual persecution was sporadic and generally the result of local initiative, official orders may have established an understanding that actual persecution would be tolerated, but in the first century of official Christianity did not generally organize it. Latin literature includes the essays, poems and other writings written in the Latin language. 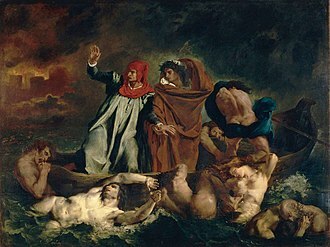 Latin literature was in ways a continuation of Greek literature. 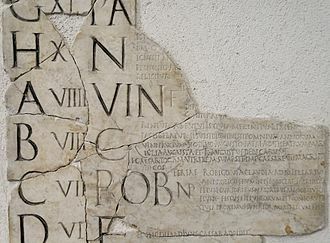 Formal Latin literature began in 240 BC, when a Roman audience saw a Latin version of a Greek play, the adaptor was Livius Andronicus, a Greek who had been brought to Rome as a prisoner of war in 272 BC. 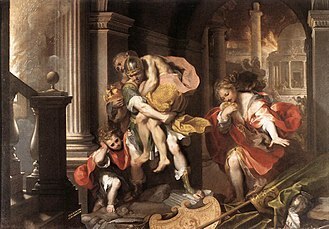 Andronicus translated Homers Greek epic the Odyssey into an old type of Latin verse called Saturnian, the first Latin poet to write on a Roman theme was Gnaeus Naevius during the 3rd century BC. He composed a poem about the first Punic War, in which he had fought. 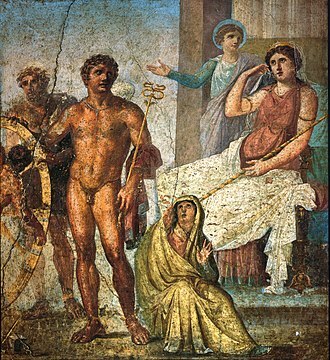 Naeviuss dramas were mainly reworkings of Greek originals, but he created based on Roman myths. 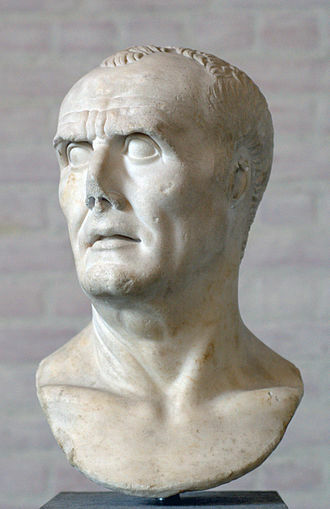 Quintus Ennius wrote an epic, the Annals, describing Roman history from the founding of Rome to his own time. He adopted Greek dactylic hexameter, which became the verse form for Roman epics. He became famous for his tragic dramas, in this field, his most distinguished successors were Marcus Pacuvius and Lucius Accius. These three writers rarely used episodes from Roman history, they wrote Latin versions of tragic themes that the Greeks had already handled. But even when they copied the Greeks, they did not translate slavishly, only fragments of their plays have survived. Considerably more is known about early Latin comedy, as 26 Early Latin comedies are extant –20 of which Plautus wrote, and these men modeled their comedies on Greek plays known as New Comedy. But they treated the plots and wording of the originals freely, Plautus scattered songs through his plays and increased the humor with puns and wisecracks, plus comic actions by the actors. Terences plays were more polite in tone, dealing with domestic situations and his works provided the chief inspiration for French and English comedies of the 17th century AD, and even for modern American comedy. The prose of the period is best known through On Agriculture by Cato the Elder, Cato wrote the first Latin history of Rome and of other Italian cities. 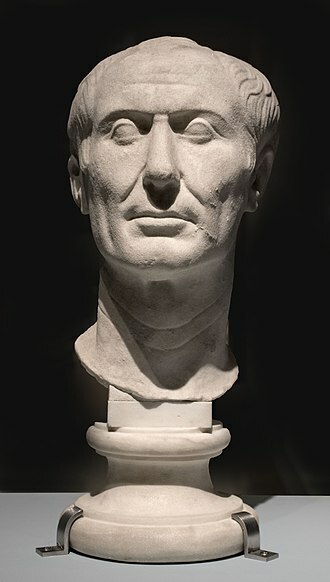 He was the first Roman statesman to put his political speeches in writing as a means of influencing public opinion, Early Latin literature ended with Gaius Lucilius, who created a new kind of poetry in his 30 books of Satires. Philosophy, political thought, and mythology are three major examples of how classical culture survives and continues to have influence. The West is one of a number of world cultures regarded as having a classical tradition, including the Indian, Judaic, the study of the classical tradition differs from classical philology, which seeks to recover the meanings that ancient texts had in their original contexts. It examines both efforts to uncover the realities of the Greco-Roman world and creative misunderstandings that reinterpret ancient values and aesthetic models for contemporary use. The classicist and translator Charles Martindale has defined the reception of antiquity as a two-way process … in which the present. 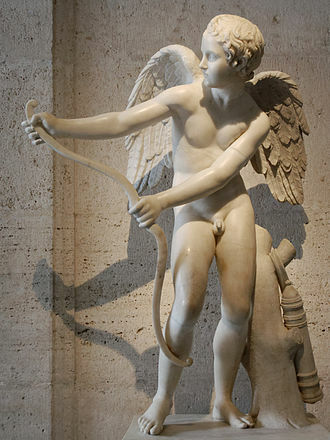 The beginning of a classical tradition is usually located in the Renaissance. The use and meaning of the tradition may seem, however. The English word tradition, and with it the concept of handing down classical culture, derives from the Latin verb trado, traditus, in the sense of hand over, hand down. 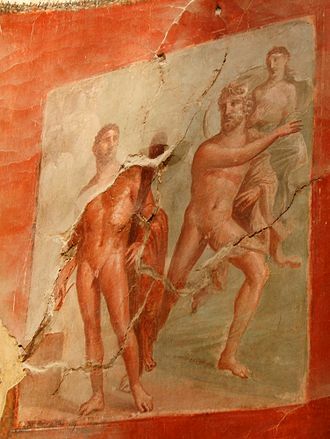 The Vinalia were Roman festivals of the wine harvest, wine vintage and gardens, held in honour of Jupiter and Venus. The Vinalia prima, known as the Vinalia urbana was held on April 23, to bless and sample last years wine, the Vinalia rustica was on August 19, before the harvest and grape-pressing. 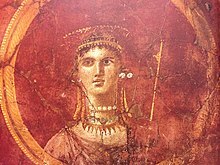 The Vinalia Urbana was held on 23 April and it was predominantly a wine festival, shared by Venus as patron of profane wine intended for everyday human use, and Jupiter as patron of the strongest, sacrificial grade wine. 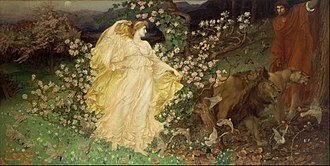 In honour of Venus, whose powers had provided humankind with ordinary wine, common girls and prostitutes gathered at Venus Erycinas Colline temple – probably on separate occasions, for proprietys sake – to offer the goddess myrtle and rushes concealed in rose-bunches. In return, they asked her for beauty and popular favour, the Vinalia Rustica was held on August 19. 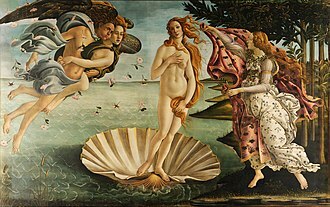 It was originally a rustic Latin harvest festival, celebrating the grape harvest, vegetable growth, at the Roman Vinalia Rustica, kitchen gardens and market-gardens, and presumably vineyards were dedicated to Venus Obsequens, the oldest known form of Venus. A libation is a ritual pouring of a liquid as an offering to a god or spirit, or in memory of those who have passed on. 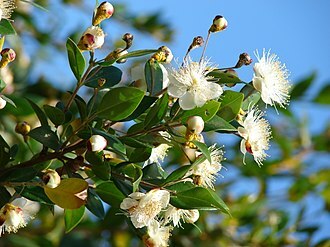 It was common in many religions of antiquity and continues to be offered in various cultures today, various substances have been used for libations, most commonly wine or olive oil, and in India, ghee. 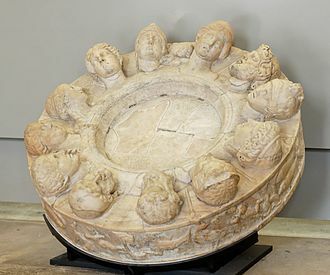 The vessels used in the ritual, including the patera, often had a significant form which differentiated them from secular vessels, the libation could be poured onto something of religious significance, such as an altar, or into the earth. In East Asia, pouring an offering of rice into a stream, symbolises the unattachment from karma. Libation was part of ancient Egyptian society where it was an offering to honor and please the various divinities, sacred ancestors, humans present and not present. It is suggested that libation originated somewhere in the upper Nile Valley and spread out to other regions of Africa, isaiah uses libation as a metaphor when describing the end of the Suffering Servant figure who poured out his life unto death. 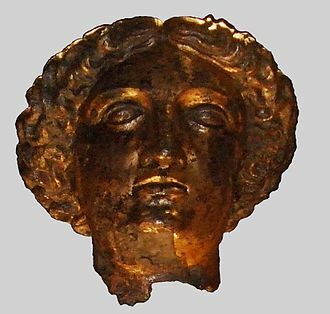 Libation was a central and vital aspect of ancient Greek religion and it is one of the basic religious acts that define piety in ancient Greece, dating back to the Bronze Age and even prehistoric Greece. Libations were a part of life, and the pious might perform them every day in the morning and evening. A libation most often consisted of mixed wine and water, but could be unmixed wine, oil, the form of libation called spondē is typically the ritualized pouring of wine from a jug or bowl held in the hand. The most common ritual was to pour the liquid from an oinochoē into a phiale, after wine was poured from the phiale, the remainder of the contents was drunk by the celebrant. 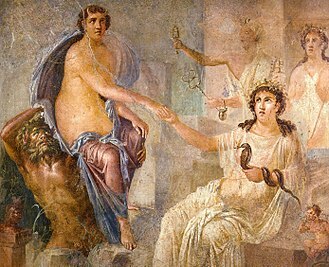 A libation is poured any time wine is to be drunk, the etiquette of the symposium required that when the first bowl of wine was served, a libation was made to Zeus and the Olympian gods. 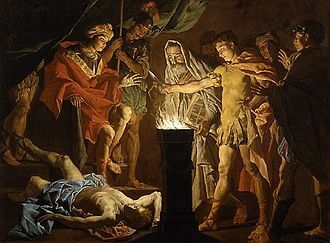 Heroes received a libation from the second krater served, and Zeus the Finisher from the third, an alternative was to offer a libation from the first bowl to the Agathos Daimon and from the third bowl to Hermes. 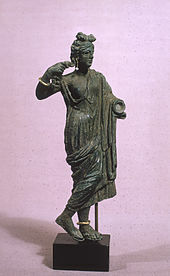 An individual at the symposium could make an invocation of, the Greeks stood when they prayed, either with their arms uplifted, or in the act of libation with the right arm extended to hold the phiale. In conducting animal sacrifice, wine is poured onto the victim as part of its ritual slaughter and preparation and this scene is commonly depicted in Greek art, which often shows sacrificers or the gods themselves holding the phiale. The Greek verb spendō, pour a libation, conclude a pact, derives from the Indo-European root *spend-, make an offering, perform a rite, the noun is spondē or spondai, libation. In the middle voice, the verb means enter into an agreement, blood sacrifice was performed to begin a war, spondai marked the conclusion of hostilities, and is often thus used in the sense of armistice, treaty. Libations poured onto the earth are meant for the dead and for the chthonic gods, in the Book of the Dead in the Odyssey, Odysseus digs an offering pit around which he pours in order honey and water. 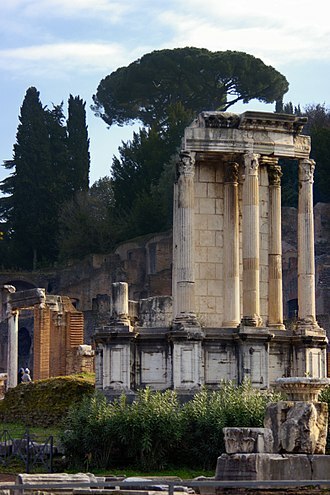 The most prominent feature of the ruins that were once the Temple of Vesta is the hearth (seen here in the foreground). 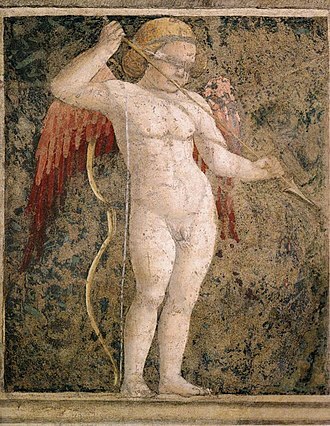 Friday is associated in many cultures with the love goddess Venus, and the planet named for her. A cult statue of the divinized Augustus, disfigured by a Christian cross carved into the emperor's forehead. 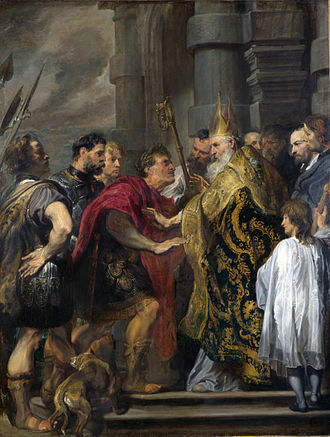 Saint Ambrose and Emperor Theodosius, Anthony van Dyck. 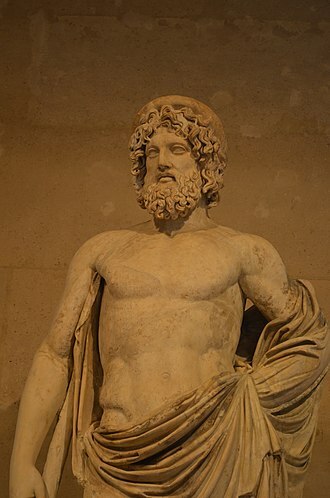 Jupiter, the supreme Roman god of the sky.